With their last few launches priced closer to the ₹ 10,000 price point, smartphone maker Xolo has come up with a new phone that has an even more affordable price tag. 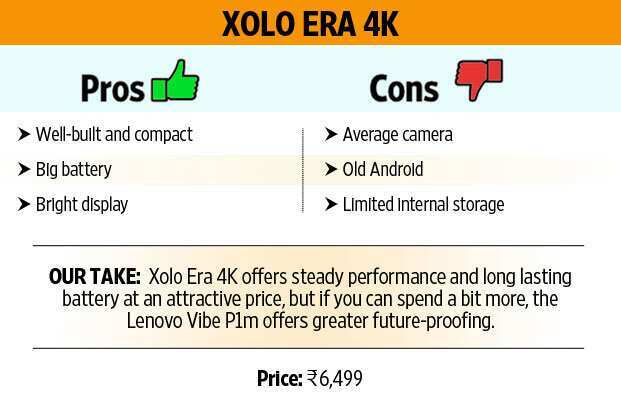 Priced at ₹ 6,499, Xolo Era 4K, comes with 4,000mah battery, and is up against the likes of Lenovo Vibe P1m ( ₹ 7,999). Like most big battery smartphones the Era 4K is chunky looking phone. The phone has an all plastic finish with a removable back panel which houses the two SIM slots and the large battery. It feels a bit heavy (157g) in the hand but due to it’s compact form factor we had no problem using it with one hand. The matte finish on the back also feels better against the skin compared to phones with glossy finish. Its rival, the Lenovo Vibe P1m is not just a better looking phone but is also a little lighter (148g) too. What gives it an edge over the Era 4K is the nano coating on the body which protects it against rain and water spills. Also, the Lenovo Vibe P1m has a dedicated battery switch that switches on the battery mode instantly. The Era 4K comes with a 5-inch display with screen resolution of 1280x720p. It is a bright-looking display, which makes it perfect for watching movies. Though the display looks a bit reflective, it handles visibility under bright light well. It also comes with a layer of Gorilla Glass 3 for added protection against scratches. The Vibe P1m also has a 5-inch 1280x720p resolution display which handles colour and reflections equally well. 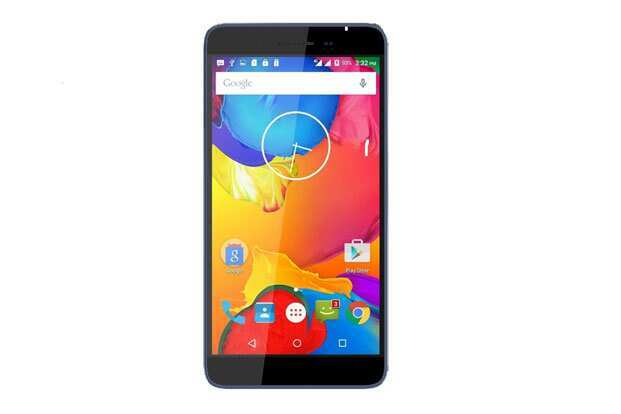 The device runs Android 5.1 (Lollipop) with the minimalist Android interface. We were a bit surprised to see Xolo use plain android when it has its own user interface called Hive. Though Hive brings in some interring design makeover, it was a bit difficult to use in comparison to stock android interface. The Vibe P1m also runs Android 5.1 but uses a more stylish and feature rich user interface Vibe UI. 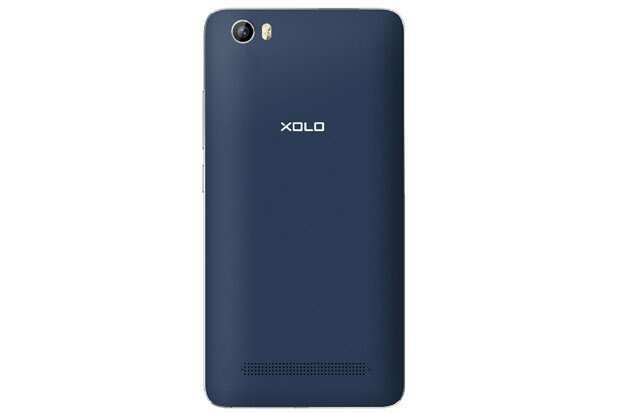 Xolo Era 4K is powered by a MediaTek 6735 processor with 2GB RAM. We have seen this processor in a number of budget phones including the Vibe P1m. However, it’s not the most powerful when it comes to handling games and multi-tasking. The phone works smoothly as long as its stressed. The odd lag surfaces with 6 to 8 apps running in the background simultaneously and with heavy games. 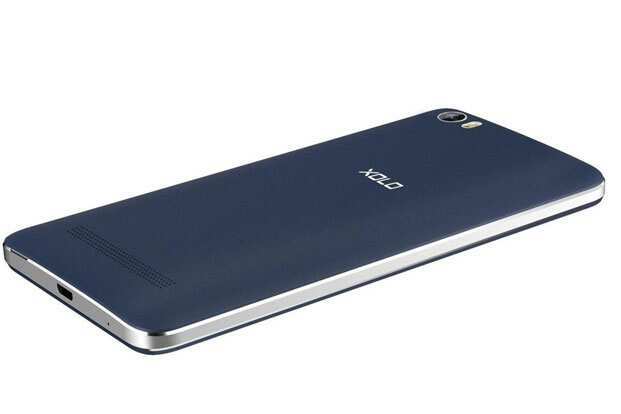 The phone provides 8GB internal storage and can accommodate another 32GB via micro SD. The Vibe P1m is no better when it comes to multi-tasking and it struggles with games too. What gives it an edge over the Xolo Era 4K is its internal storage, as it offers 16GB of inbuilt storage which is expandable to another 32GB via micro SD. The Era 4K’s biggest highlight is its battery. Even with moderate to heavy use, it delivers about two days of backup with ease. In case the battery is really low, you can switch on the battery saver mode. The battery saver mode is an interface in itself. It switches on to a black and white single page interface and restricts all features and apps on the phone except browser, maps, calendar, clock and calculator. The Vibe P1m’s 3,900mAh battery also lasts a day and half and has a similar battery saver mode. The phone has an 8-megapixel camera which supports touch to focus and has a dual LED flash. 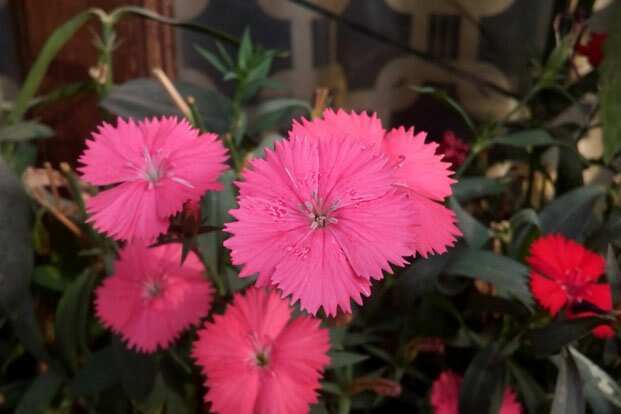 The camera feels a bit sluggish and the picture quality is average. Even in natural light, it struggles with detailing and lighting. It tends to darken non-focus areas. It captures colour in areas under focus very well, though. The night shots are again a mixed bag. In indoor shots, colours looked washed out, however, we were able to read text clearly. The Vibe P1m is slightly better placed in this regard as its daytime shots look more detailed and colourful. The smartphone offers adequate performance for most use cases, but it is the long lasting battery and the impressive display that really get the attention. However, the Lenovo Vibe P1m has a better camera, and the design looks a bit more sophisticated as well.